MiniJam, InnoGear's flagship product, is finally here. Has it been worth the wait for the first MP3 Springboard module for the Visor? In a word, yes. When you open your MiniJam box, don't throw anything away -- there's a lot of stuff in there. The MiniJam itself has an LED, buttons for volume, play/pause, forward, back, Sound Control, and MiniJam Control. There are also jacks for power and headphones. There are two slots for Multimedia Cards (MMCs). The A slot (with the MiniJam logo) has a spring that lets you click the MMC in securely. The B slot on the back is recessed, and MMC is inserted similar to how traditional RAM is installed into a computer. 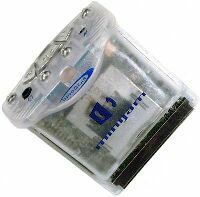 2MB of Flash RAM is also included in the module, which comes in either graphite or ice with a 32MB or 64MB MMC. Other included accessories are 16 ohm earbud style headphones with a reel-up case, either 32 or 64MB MMC, a soft pouch for carrying your Visor with the MiniJam, and desktop software. Don't lose the Welcome letter as the registration code for MusicMatch is on it. Peanut Reader and AlbumToGo are also included. MJLoader is the basic software that is used to upload files from the desktop to the Visor. One nice thing is that it completely bypasses HotSync, making the uploading of songs faster. Uploading files is easy. Run MJLoader on the PC. Put the Visor in its cradle and run MiniLoader on the Visor. Once a connection is made, a list of MP3 files will appear for each card slot. You can delete songs from the MMC at this point. Drag-and-drop files from a folder on your computer to the appropriate MMC. Click Commit to begin transferring files to the MiniJam. 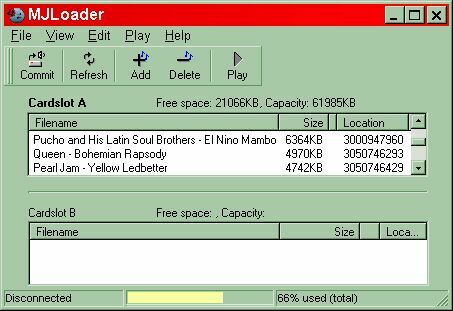 In my testing, it took 1:54 to transfer a 4039KB file, for a transfer speed of 2.08MB/min when using MJLoader to transfer songs to the MiniJam. Deleting a track took only a few seconds. This is under Windows 98. Feel free to give me a Cube so I can do future Mac testing.